Crispy Fruit snacks from Crispy Green are 100% freeze-dried fruit slices that are made of pure fruit and nothing else. The taste in Crispy Fruit comes from the fresh fruit itself. Our line of all-natural snacks starts with top-quality fresh fruit, sourced from certified, carefully selected growers who undergo a stringent audit review process. All fruit is processed and freeze dried according to the Hazard Analysis and Critical Control Point (HACCP) system, an international standard that identifies critical control points, sets safety procedures and preventive measures, and maintains strict documentation for certification. Crispy Green's manufacturing facilities are kosher certified by Orthodox Union, and do not process products containing peanuts or other tree nuts. Crispy Green products are packaged in high quality triple-layer poly-bags with an aluminum lining to protect the finished products from moisture and light for a long shelf-life. There are no sweeteners or other additives used to enhance the taste or appearance of Crispy Fruit, and it is a Non-GMO Project Verified snack. 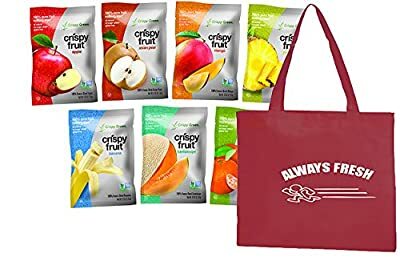 Crispy Green's premium Crispy Fruit freeze-dried fruit snacks are an excellent choice for anyone who wants to live a healthier lifestyle without compromising on taste! The ultimate 'grab-n-go' snack, Crispy Fruit is convenient, healthy and delicious! Product of China.